He was ordained around this time after he received his doctorate and he taught philosophy and theology for almost a decade in Ascoli, Bologna and Milan. He later returned to Rome as the regent of the college that he studied in and was later elected as the Definitor General of the order in 1741. In the general chapters of his order in 1753 and 1756, he declined the generalship of his order and some rumored it was due to his desire of a higher office. Ganganelli became a friend of Pope Benedict XIV who in 1758 appointed him to investigate the issue of the traditional blood libel regarding the Jews, which Ganganelli found to be untrue. Pope Clement XIII elevated Ganganelli to the cardinalate on 24 September 1759 and appointed him as the Cardinal-Priest of San Lorenzo in Panisperna. His elevation came at the insistence of Lorenzo Ricci who was the Superior-General of the Society of Jesus. Ganganelli opted to become the Cardinal-Priest of Ss. XII Apostoli in 1762. In 1768 he was named the "ponens" of the cause of beatification of Juan de Palafox y Mendoza. King Louis XV of France's (1715–74) minister, the duc de Choiseul, had former experience of Rome as the French ambassador and was Europe's most skilled diplomat. "When one has a favour to ask of a Pope", he wrote, "and one is determined to obtain it, one must ask for two". Choiseul's suggestion was advanced to the other ambassadors and it was that they should press, in addition to the Jesuit issue, territorial claims upon the Patrimony of Peter, including the return of Avignon and the Comtat Venaissin to France, the duchies of Benevento and Pontecorvo to Spain, an extension of territory adjoining the Papal States to Naples, and an immediate and final settlement of the vexed question of Parma and Piacenza that had occasioned a diplomatic rift between Austria and Pope Clement XIII. 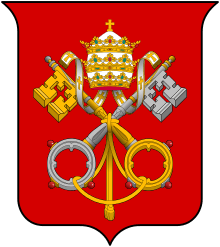 The conclave had been sitting since 15 February 1769, heavily influenced by the political manoeuvres of the ambassadors of Catholic sovereigns who were opposed to the Jesuits. Some of the pressure was subtle: for an unprecedented impromptu visit to the conclave by Emperor Joseph II (1765–90) and his brother Leopold, the Grand Duke of Tuscany officially incognito, the seals were broken, the Austrians inspected the proceedings with great interest and brought with them a festive banquet. During the previous pontificate, the Jesuits had been expelled from Portugal and from all the courts of the House of Bourbon, which included France, Spain, Naples, and Parma. Now the general suppression of the order was urged by the faction called the "court cardinals", who were opposed by the diminished pro-Jesuit faction, the Zelanti ("zealous"), who were generally opposed to the encroaching secularism of the Enlightenment. 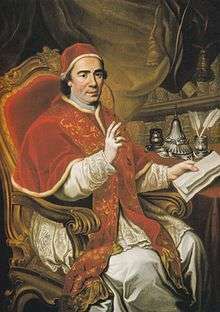 Cardinal Ganganelli was elected pope on 19 May 1769 largely due to support of the Bourbon courts which had expected that he would suppress the Society of Jesus. 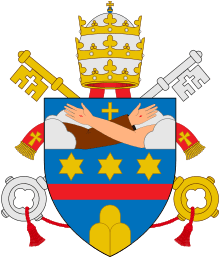 He took the pontifical name of "Clement XIV". 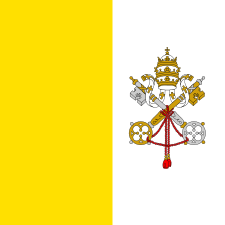 Ganganelli first received episcopal consecration in the Vatican on 28 May 1769 by Cardinal Federico Marcello Lante and was crowned as pope on 4 June 1769 by the cardinal protodeacon Alessandro Albani. Clement XIV's policies were calculated from the outset to smooth the breaches with the Catholic Crowns that had developed during the previous pontificate. The dispute between the temporal and the spiritual Catholic authorities was perceived as a threat by Church authority, and Clement XIV worked towards reconciliation among the European sovereigns. The arguing and fighting among the monarchs seemed poised to lead Europe towards heavy international competition. By yielding the Papal claims to Parma, Clement XIV obtained the restitution of Avignon and Benevento and in general he succeeded in placing the relations of the spiritual and the temporal authorities on a friendlier footing. The pontiff went on to suppress the Jesuits, writing the decree to this effect in November 1772 and signing it on 21 July 1773. This measure, to late 19th-century Catholics, had covered Clement XIV's memory with infamy in his church, and was also quite controversial, with the Catholic Encyclopedia supporting Clement XIV's suppression of the Jesuits as "abundantly justified". His work was hardly accomplished before Clement XIV, whose usual constitution was quite vigorous, fell into a languishing sickness, generally attributed to poison. No conclusive evidence of poisoning was ever produced. The claims that the Pope was poisoned were denied by those closest to him, and as the Annual Register for 1774 stated, he was over 70 and had been in ill health for some time. The Jesuits had been expelled from Brazil (1754), Portugal (1759), France (1764), Spain and its colonies (1767), and Parma (1768). Though he had to face strong pressure on the part of the ambassadors of the Bourbon courts, Clement XIII always refused to yield to their demands to have the Society of Jesus suppressed. His successor Clement XIV tried to placate their enemies by treating the Jesuits harshly: he refused to meet the Superior General, Lorenzo Ricci, ordered them not to receive novices, etc. The pressure kept building up to the point that Catholic countries were threatening to break away from the Church. Clement XIV ultimately yielded "in the name of peace of the Church and to avoid a secession in Europe" and suppressed the Society of Jesus by the brief Dominus ac Redemptor of the 21 July 1773. However, in non-Catholic nations, particularly in Prussia and Russia, where papal authority was not recognized, the order was ignored. It was a result of a series of political moves rather than a theological controversy. Tomb of Pope Clement XIV. Pope Clement XIV and the customs of the Catholic Church in Rome are described in letters of Wolfgang Amadeus Mozart and of his father Leopold Mozart, written from Rome in April and May 1770 during their tour of Italy. Leopold found the upper clergy offensively haughty, but was received, with his son, by the pope, where Wolfgang demonstrated an amazing feat of musical memory. The papal chapel was famous for performing a Miserere mei, Deus by the 17th-century composer Gregorio Allegri, whose music was not to be copied outside of the chapel on pain of excommunication. The 14-year-old Wolfgang was able to transcribe the composition in its entirety after a single hearing. Clement made young Mozart a knight of the Order of the Golden Spur. Clement XIV elevated sixteen new cardinals into the cardinalate in twelve consistories. The pope held no canonizations in his pontificate but he beatified a number of individuals. The last months of his life were embittered by his failures and he seemed always to be in sorrow because of this. On 10 September 1774, he was bedridden and received Extreme Unction on 21 September 1774. It is said that St. Alphonse Liguori assisted Clement XlV in his last hours by the gift of Bilocation. Clement XIV died on 22 September 1774, execrated by the Ultramontane party but widely mourned by his subjects for his popular administration of the Papal States. When his body was opened for the autopsy, the doctors ascribed his death to scorbutic and hemorrhoidal dispositions of long standing that were aggravated by excessive labour and the habit of provoking artificial perspiration even in the greatest heat. His Neoclassical style tomb was designed and sculpted by Antonio Canova, and it is found in the church of Santi Apostoli in Rome. To this day, he is best remembered for his suppression of the Jesuits. 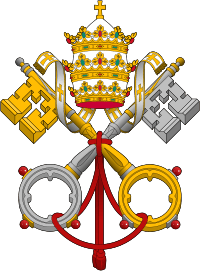 [N]o Pope has better merited the title of a virtuous man, or has given a more perfect example of integrity, unselfishness, and aversion to nepotism. Notwithstanding his monastic education, he proved himself a statesman, a scholar, an amateur of physical science, and an accomplished man of the world. As Pope Leo X (1513–21) indicates the manner in which the Papacy might have been reconciled with the Renaissance had the Reformation never taken place, so Ganganelli exemplifies the type of Pope which the modern world might have learned to accept if the movement towards free thought could, as Voltaire wished, have been confined to the aristocracy of intellect. In both cases the requisite condition was unattainable; neither in the 16th nor in the 18th century has it been practicable to set bounds to the spirit of inquiry otherwise than by fire and sword, and Ganganelli's successors have been driven into assuming a position analogous to that of Popes Paul IV (1555–59) and Pius V (1566–72) in the age of the Reformation. The estrangement between the secular and the spiritual authority which Ganganelli strove to avert is now irreparable, and his pontificate remains an exceptional episode in the general history of the Papacy, and a proof how little the logical sequence of events can be modified by the virtues and abilities of an individual. 1 2 3 "Ganganelli, O.F.M. Conv., Lorenzo (1705-1774)". Cardinals of the Holy Roman Church. Retrieved 22 February 2015. ↑ "The Suppression of the Jesuits by Pope Clement XIV," The Catholic American Quarterly Review, Vol. XIII, 1888. ↑ Roehner, Bertrand M. (1997). "Jesuits and the State: A Comparative Study of their Expulsions (1590–1990)". Religion. 27 (2): 165–182. doi:10.1006/reli.1996.0048. Wikimedia Commons has media related to Pope Clement XIV. Beach, Chandler B., ed. (1914). "Clement XIV". The New Student's Reference Work. Chicago: F. E. Compton and Co.